Lovely project! 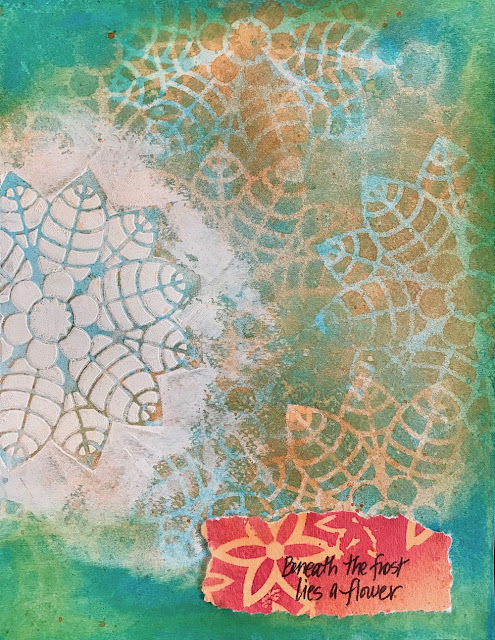 I like the texture, coloring and that stencil is really cool! :) Thanks for the inspiration. Fabulous project and I love the quote ... I love the thought that flowers are hiding in the frost and snow! Many congratulations on being GD at Mixed Media Monthly Challenge. I love your art page so much, specially the way you added these so lovely and bright colors together. Stencil is so beautiful. I love these flowers under the frosty stencil and sentiment/quote is so inspiring as well. Thank you so much for sharing such a lovely inspiration. Have lovely and crafty weekend, my friend. Thanks so much for visiting my blog - I look forward to visiting yours, too!